Consciousness, Language, and Self proposes that the human self is innately bilingual. Conscious mind includes two qualitatively distinct mental processes, each of which uses the same formal elements of language differently. The "mother tongue," the language of primordial consciousness, begins in utero and our second language, reflective symbolic thought, begins in infancy. Michael Robbins describes the respective roles the two conscious mental processes and their particular use of language play in the course of normal and pathological development, as well as the role the language of primordial consciousness plays in adult life in such phenomena as dreaming, infant-caregiver attachment, creativity, belief systems and their effects on social and political life, cultural differences, and psychosis. Examples include creative persons, extreme political figures and psychotic individuals. Five original essays, written by the author’s current and former patients, describe what they learned about their aberrant uses of language and their origins. This book sheds new light on several controversies that have been limited by the incorrect assumption that reflective representational thought and its language is the only conscious mental state. These include the debate within linguistics about whether language is the expression of a hardwired instinct whose identifying feature is recursion; within psychoanalysis about the nature of conscious and unconscious mental processes, and within cognitive philosophy about whether language and thought are isomorphic. 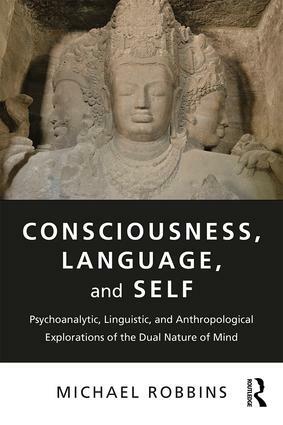 Consciousness, Language, and Self will be of great value to psychoanalysts, as well as students and scholars of linguistics, cognitive philosophy and cultural anthropology. -Daniel L. Everett, Dean of Arts and Sciences at Bentley University; formerly Chair of the Department of Languages, Literatures and Cultures at Illinois State University; author of Don’t Sleep, There are Snakes. -Neville Symington, author, former President of the Australian Psychoanalytic Society, and recipient of the Sigourney award of the International Psychoanalytic Association. 'Michael Robbins goes yet more deeply into his exploration of early mentation, which he first revealed to us in ‘Experiences of Schizophrenia’ and ‘The Primordial Mind in Health and Illness’. In ‘Consciousness, Language, and Self' he explores the hidden meaning of language in its normal and pathological forms. Neurophysiology, psychoanalysis, infant research, relational theories and clinical experience are masterfully interwoven to form an intellectual tour de force that sheds new light on the exploration of the mental processes at the root of the sense of self. His patients’ essays offer unique empirical access to the mind’s most intimate and mysterious elements. Robbins’ creative yet rigorous study of language will guide the reader into the innermost part of the human mind. This book is essential reading for every analyst interested in primitive mental states and psychosis, and all clinicians and practitioners’ and students of mental health will be enlightened by this vibrant and profound contribution." "Robbins, a psychoanalyst formerly on the faculty at Harvard Medical School, presents his bilingual theory of consciousness, consisting of two forms of conscious mental activity. The primordial consciousness or “mother tongue” (humans' first language) begins in utero and is characterized by body sensation and a sense of unity; it is undifferentiated and sociocentric and implies agency with a language of images. The second consciousness of this bilingual experience is that of reflective representational thought; beginning in infancy, this develops with mother-infant attachment and neural maturation. This thought process accompanies self-awareness and enables reflective symbolic thought. Robbins goes on to explore primordial consciousness as a separate entity—not a developmental stage—and illustrates its potential throughout life, setting the stage to compare and contrast various theories of consciousness and language, including aberrations. Julian Jaynes, Sigmund Freud, Melanie Klein, John Bowlby, Noam Chomsky, and Steven Pinker (among others) are discussed throughout. This will be a fascinating read for psychoanalysts but will also appeal to students and scholars in developmental psychology, consciousness studies, cultural anthropology, and linguistics. A clear, well researched text." Michael Robbins is a psychoanalyst and was formerly professor of clinical psychiatry at Harvard Medical School and the University of California San Francisco. He is a member of the American and International Psychoanalytic Associations. His previous books include Experiences of Schizophrenia, Conceiving of Personality, and The Primordial Mind in Health and Illness: A Cross-Cultural Perspective.